I know what you’re thinking..you love pizza? Then why don’t you marry it. I do love pizza. Almost as much as Kel loves orange soda. (what’s that? TWO 90’s throwbacks :)) But for real, I could eat it everyday. No. I WISH I could eat it everyday. Truth is I can’t anymore. I’m getting old, I’m almost 26, and my body just can’t handle pizza like it used to. Not just that but I’ve got bills to pay and Papa John’s is freaking expensive. Ok, so now that you are craving that delicious, cheesy, Papa John’s pizza dipped in garlic sauce when it’s half off because the Texas Rangers scored 7 runs the night before…let me tell you about the yummy pizza I made at home. 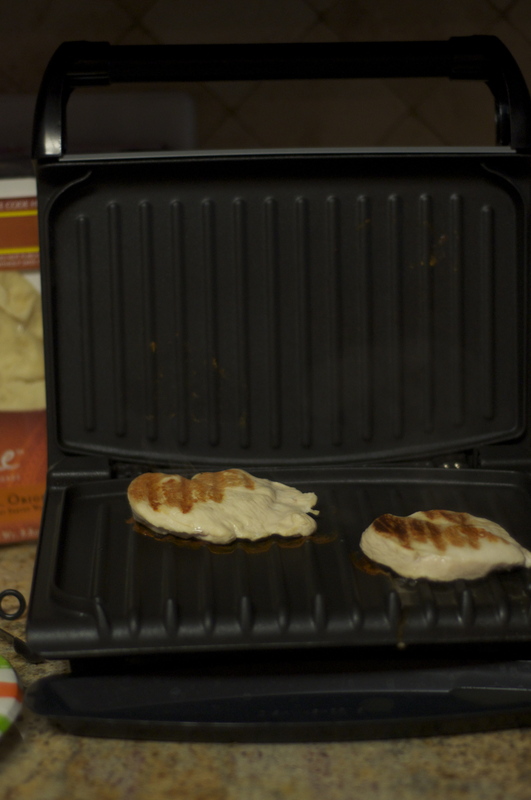 First, I thawed two chicken breasts and cooked them on my George Forman grill. In case you’ve never used one of these before, they are fantastic. It took SIX minutes to cook the chicken breasts!!! After cooking the chicken breasts I used two forks to shred the chicken. Then, I covered the Naan in a light layer of pesto. It is important not to put too much because honestly, a big chunk of pesto doesn’t taste that good. 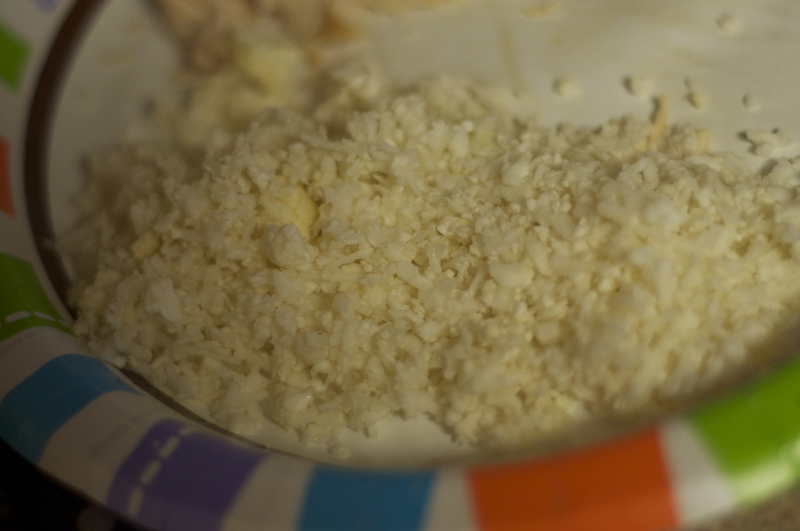 grated cauliflower!!!!! Doesn’t it kinda look like cheese?! Wanna know why this is so exciting? 2. It looks like cheese. 3. You can’t really taste it. 4. You’re eating a vegetable without even realizing it! Anyways, once I had all of my toppings on, I put the pizzas in the oven on 400 degrees for about 4-5 minutes. Just enough to warm it up. this meal is Husband Approved!